Faze Reader: I want to make a good impression on my first date with this girl I’ve been after for the last four months. Any suggestions for a romantic and unforgettable date? ED REPLIES: Well, ‘romantic’ and ‘unforgettable’ are not always tied together. Hugh Grant’s date with Divine Brown was likely unforgettable, but hardly romantic. You could start with flowers, candlelight, soft music…but you probably shouldn’t. Women hate nothing more than a guy who tries too hard. A woman likes to know you listen to her, so pick a place or activity based on things she’s told you she likes. Romance can be just as potent while looking through old record stores and thrift shops as it is at a fancy dinner. Real romance comes from chemistry between two people…and it’s either there or it isn’t. Faze Reader: My boyfriend is great in every way except…he’s got staaank bad breath! I’ve given him a lot of not-so-subtle hints but he still doesn’t seem to get it! How should I handle it without embarrassing him? ED REPLIES: You could eat a lot of cheap Mexican food and use the toilet at his place, and when he complains about the smell, tell him, “Look who’s talking!” You may also want to remind him that the Geneva Convention forbids gas warfare. Or you could leave this magazine open near him, with this portion circled. But if you’ve got a decent relationship, just tell him. The embarrassment will fade as the kissing increases. Faze Reader: Hey Ed, my girl is ALWAYS late! We missed the beginning of the last four movies we went to and her excuses were really lame. I’m ready to say ‘see ya’. Should I? 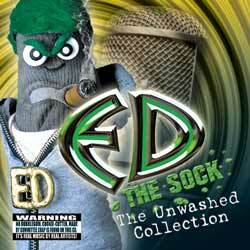 ED REPLIES: Listen, most movies are crap-on-a-stick, but a decent girlfriend you click with is a rarity. Wait for the movie to come out on DVD. And get used to it – it’s pretty typical for guys to ‘get there’ first. Faze Reader: My new girlfriend lets her dog slobber-kiss her all over her lips and face. It is absolutely disgusting! Later when she wants to get ‘friendly’, I keep thinking about the dog thing and get really turned off. What should I do? ED REPLIES: First of all, you should know that a dog’s mouth actually has less bacteria and stuff than a human’s mouth, so if anyone should be disgusted by your girlfriend’s kisses, it’s the dog. But look at it this way – dog’s give very wet and sloppy kisses, so by comparison, you must seem like the world’s greatest kisser. As long as the dog gets the kissing and you get the petting, I wouldn’t worry. Faze Reader: When my boyfriend and I are alone he is so affectionate. He holds my hand, plays with my hair, etc. But when his boys are around I’m lucky if he’ll stand next to me. What’s up with that? ED REPLIES: Half of me is thinking, “Good for him,” because there’s nothing tackier than people in public writhing on each other like animals in heat. On the other hand, though, he’s probably afflicted with that stupid old attitude that showing affection to a girl in front of his friends isn’t ‘macho’. Truth is, worrying about what’s ‘macho’ isn’t ‘macho’, and real men can show feelings without being girly-men…just don’t start crying at chick flicks, that’s going a little too far. Faze Reader: I am soo sick of this ‘equal opportunity’ crap! Whoever is the most qualified should get the job. End of story. Why hire someone who is less qualified just because they are female, a visible minority or handicapped. What does this accomplish? ED REPLIES: Affirmative action started because people were too stupid to just hire the most qualified person for the job – they hired the person who was most-male and most-white. ‘Equal Opportunity’ is just that — giving people of all backgrounds the same footing in getting a job. Maybe you find this hard to believe, but there are people who are qualified for jobs who are also women, visible minorities or handicapped. And if you think every white person who has a job is the person best qualified for it, come visit me at work one afternoon. Morons galore. Faze Reader: When we go to concerts my friend gets freaky! She screams, cries, pulls her hair and sometimes flashes! I get soooo embarrassed! How do I tone her down? ED REPLIES: Videotape her and put it on the Internet so she can see how stupid she looks. Add a ‘member’s section’, you could make some good money.